The cow horn bugle is thought to be one of mankind's oldest instruments. These bugles have been used throughout history by the Vikings and more recently by European hunters and shepherds. They are still used as ceremonial tools or summoning instruments. 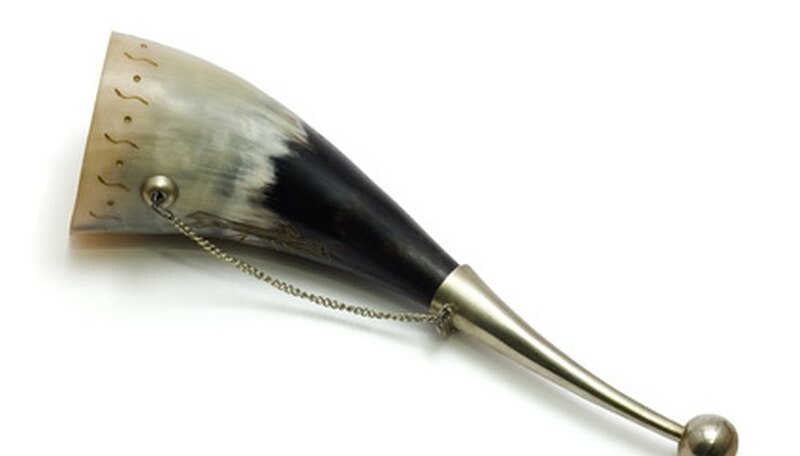 The cow horn bugle is made from a single cow horn and can be polished or adorned as the creator desires. It can play up to three notes, with several variations of sound, in the hands of a skilled player. Because the cow horn bugle is made from a naturally occurring material, no two are alike. Saw three inches off the pointed end of the horn using a coping saw. This will become the mouthpiece. Measure around the tip of the mouthpiece to find the area that is 5/8 inches in diameter. Mark this section and saw off the tip at that point. Discard the tip. Drill a 3/8-inch hole through the narrow end of the mouthpiece using a boring tool or a hand drill. Insert a file into the large end of the mouthpiece, and file the walls down to 1/8 of an inch throughout. File the narrow opening of the horn to a thickness of 1/8 inch. Smooth the horn and mouthpiece with a rasp or file, moving on to steel wool or sandpaper as the horn grows sleeker. Wax the horn and mouthpiece, and shine them with a buffing cloth. Insert the small end of the prepared tip into the small end of the horn by twisting gently but firmly.